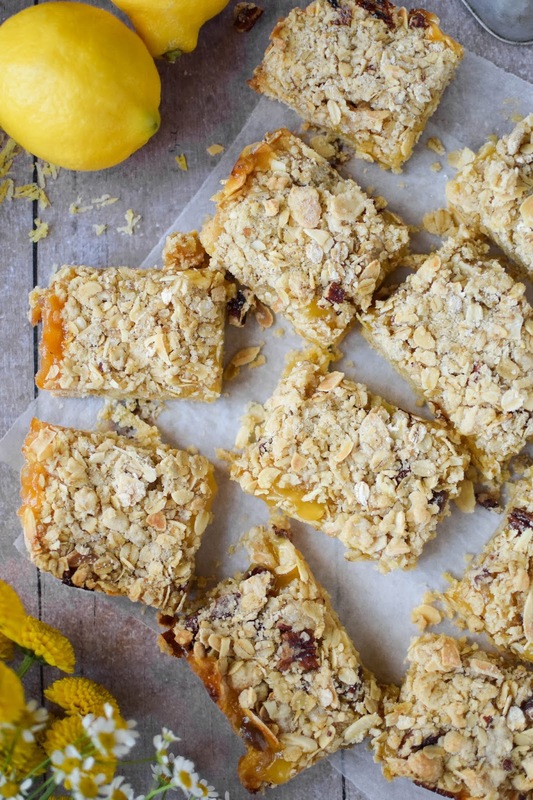 These deliciously zingy, lemon curd crumble bars are to die for. Bright and tangy lemon curd sandwiched between a buttery biscuit base and a nutty, oaty crumble layer. Simply brew up a pot of Earl Grey and enjoy. Cake pit stops are vital for any day out, don’t you agree? For me, it simply isn’t a successful outing if we haven’t stopped for a spot of tea and cake. A few weeks ago, Kris and I were on one of our many antique hunting trips (I saw we, I mean me while he follows me through dusty piles of vintage kitchenware, grumbling under his breath) when we passed the cutest little cake shop. Obviously it’s against the law to be British and ignore tea and cake so in we went. 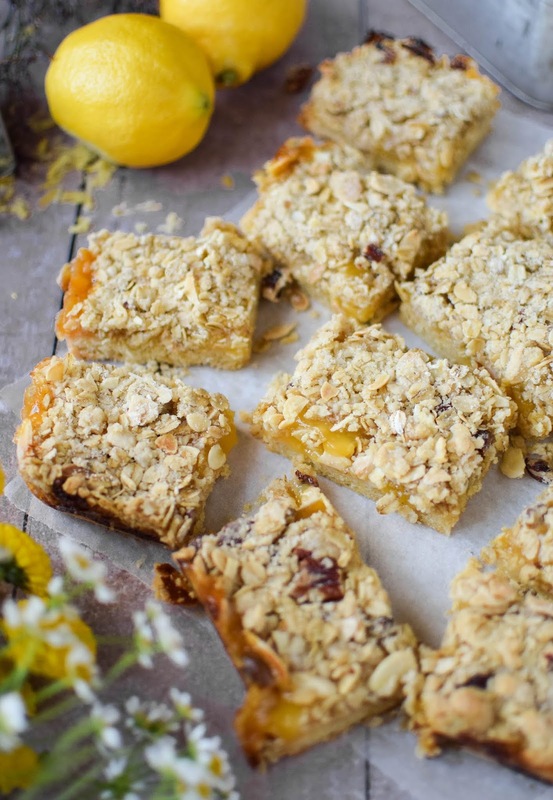 Instantly my eyes went straight to a pile of lemon curd crumble bars. Not other cake mattered to me in that instance, this was the sweet treat for me. So I ordered myself a bar and a cup of Earl Grey (Kris had something mile high and covered with chocolate, standard) and settled down by the window to enjoy my spoils. Needless to say, dear reader, it was crap! It tasted like it had been sat out since the dawn of time, cardboard would have packed a better punch than this sorry affair. Is there anything more disappointing? I left, deflated and unsatisfied, with a solemn vow never to return and to make my own version at home. A version that is not, indeed, crap. Well, I think I nailed it! A super buttery shortbread base, laced with lemon zest topped with creamy lemon curd before an oaty, crumble layer is added. Screw your cardboard cakes, this sucker has lemony goodness in every mouthful. 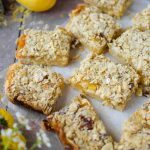 I just love these lemon curd crumble bars, not only are they super simple to make but I always seem to have the ingredients to hand. I mean, if you don’t constantly have a jar of lemon curd in your cupboard, can we even be friends? 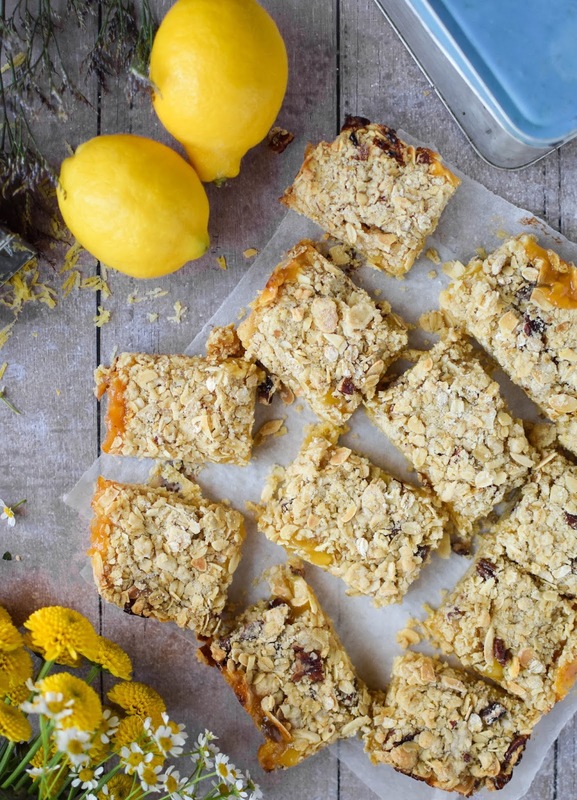 These deliciously zingy, crumbly bars are to die for. Bright and tangy lemon curd sandwiched between a buttery biscuit base and a nutty, oaty crumble layer. Simply brew up a pot of Earl Grey and enjoy. Preheat the oven to 175°C, grease and line a 22cm square tin with baking parchment. In a food processor, pulse together the butter and flour until soft crumbs form. Stir in the caster sugar and salt, then remove 1 /3 of the mixture and set aside in a bowl. Add the baking powder, egg and lemon zest to the remaining mixture in the food processor and continue to pulse until combined. Tip into the baking tin and press down to form an even layer. Bake for 15 minutes, then allow to cool for 10 minutes. Meanwhile, add the demerara sugar, oats and nuts to the reserved mixture with the butter and add 1tbsp water. Using your fingers rub the butter into the dry mixture until it’s all nice and chunky. Spread the lemon curd over the biscuit base, then top with the crumble mixture. Bake for 20 minutes, or until lightly golden. Remove and allow to cool completely in the tin. Remove from the tin and slice into bars. These bars last for up to 4 days if kept in a air tight tin. If lemon curd isn’t your thing, try substituting with a different flavoured curd, or jam. They look amazing. I'd forgotton how much I love lemon curd! I love citrus flavours in bakes. These look yummy! These sound fantastic! I'm a big fan of lemon curd, I love it's zesty flavour. Oo these look and sound delicious! I do love home made treats! These sound like Heaven on a plate – I love anything lemony. Will need to try making a GF version. These look delish ! I love anything Lemony, pinned for later!